Extras Include Featurettes, Comic-Con Panel, Deleted Scenes and a Gag Reel! "Krypton," the all-new series from executive producers David S. Goyer (Man of Steel, The Dark Knight Trilogy) and Cameron Welsh (Constantine) tells the origin story of DC’s iconic Superman in a whole new way. Just in time for the second season on SYFY, Warner Bros. Home Entertainment will release the action-adventure hit series "Krypton: The Complete First Season" on Blu-ray and DVD on March 5, 2019. Fans can purchase the set which, in addition to all 10 exhilarating episodes from season one, contains over an hour of extra content, including the 2017 Comic-Con panel, featurettes, deleted scenes and a gag reel. 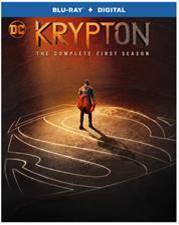 "Krypton: The Complete First Season" is priced to own at $24.98 SRP for the DVD and $29.98 SRP for the Blu-ray which includes a Digital Copy. "Krypton: The Complete First Season" is also available to own on Digital via purchase from digital retailers. What if Superman never existed? Set two generations before the destruction of Superman’s home planet, Krypton follows a young Seg-El, the legendary Man of Steel’s grandfather, who is faced with a life and death conflict – save his home planet or let it be destroyed in order to restore the fate of his future grandson. With Krypton’s leadership in disarray and the House of El ostracized, Seg fights alongside Earthly time-traveler Adam Strange to redeem his family’s honor and protect the ones he loves while saving the future of his legacy from DC Super-Villain Brainiac. With Blu-ray’s unsurpassed picture and sound, the Blu-ray release of "Krypton: The Complete First Season" will include 1080p Full HD Video with DTS-HD Master Audio for English 5.1. The 2-disc Blu-ray will feature a high-definition Blu-ray and a Digital Copy of all 10 episodes from season one. Krypton stars Cameron Cuffe (New Year’s Eve), Georgina Campbell (One Night, Black Mirror), Shaun Sipos (Final Destination 2), Colin Salmon (Arrow), Elliot Cowan (The Golden Compass), Ann Ogbomo (Wonder Woman, Justice League), Aaron Pierre (Britannia, The A Word), Rasmus Hardiker (Your Highness), Wallis Day (Will), with Blake Ritson (Da Vinci’s Demons, Indian Summers) and Ian McElhinney (Game of Thrones). 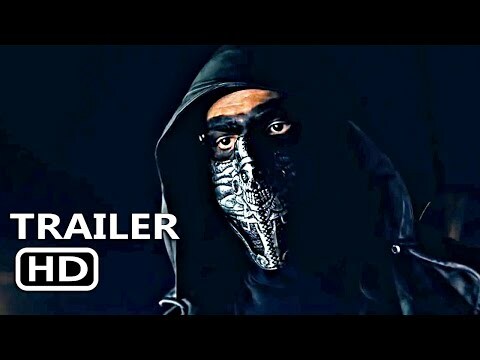 Based on the DC characters created by Jerry Siegel and Joe Shuster, Krypton is from Phantom Four Films in association with Warner Horizon Scripted Television and is executive produced by David S. Goyer alongside Cameron Welsh.